If you decide to enroll as an APhA member on the Site, you will also be asked for the college(s) of pharmacy or other educational institutions from which you have earned degrees, your date(s) of graduation, and the APhA Academy and Section you wish to join. APhA members may also elect to join one or more special interest groups and to receive certain e-newsletters that are provided as a benefit of membership. APhA members may opt in or out of APhA e-newsletters by updating their profiles on the Site. After logging into the Site, click on your name then "Edit my Preferences." In addition, the name, address, e-mail, telephone, and fax numbers you provide on the Site may be used to send you APhA periodicals, resource catalogs, information on programs such as the APhA Annual Meeting, educational programs, and announcements from APhA, and e-newsletters and ballots for APhA elections. Pharmacist.com may disclose personally identifiable information in special cases if we find it necessary to identify, contact, or bring legal action against someone who may be violating the policies of the Site or APhA or causing injury to or interference with the Site, its users, or anyone else that could be harmed by such activities. Pharmacist.com also may disclose personally identifiable information as is required or appropriate in order to comply with the law. The information stored in your profile and Continue Education account is protected by the user name and password that you were provided when your pharmacist.com account was created. You may change your user name and password at any time by logging onto the Site, clicking “Login” then “Request a New Password.” You are encouraged to change passwords periodically and to protect your user name and password as you would other personally sensitive information. 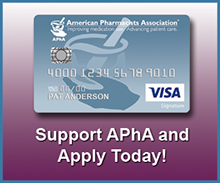 While APhA takes commercially reasonable steps to secure your information collected on the Site, you can do your part to protect the information collected on the Site about you by securing your pharmacist.com user name and password as described above, and by logging out when you finish using the Site. However, you should be aware that despite the security procedures that APhA employs, no security system is impenetrable nor can we guarantee that the information you provide will not be intercepted while being transmitted over the internet or residing on or through the Site. You should particularly note that although it is illegal to intercept, disclose or otherwise access these messages and data under Federal law, e-mail is not secure, so you should not send confidential or personally sensitive information via e-mail. Pharmacist.com provides users with 24-hour access to their personal information after it has been collected. You can access all of your personally identifiable information that we collect online (your "profile") and maintain it by logging into the Site and clicking on your name. You may also send changes to APhA Membership Services Department, 2215 Constitution Avenue, NW, Washington, DC 20037. To further protect your privacy and security, we will also take reasonable steps to verify your identity before granting access to make corrections. When you update information, we usually keep a record of the prior version for our records. Pharmacist.com contains links to other websites. Pharmacist.com has no control over, and is not responsible for, the privacy policies or content of these sites.